A major pilgrim center for both Buddhist and Jains, Vaishali is a small village situated in Bihar state. It is located 55 kilometers from Patna. The name Vaishali is derived from King Visala who ruled here, mentioned in the epic Ramayana. Believed to be one of the first cities in the world to become a republic, Vaishali's history dates back to the 6th century BC when it was a flourishing city of the Lichchavi clan. And while Pataliputra (capital of the Mauryas and the Guptas), held political sway over the Gangetic plain, Vaishali was the center for trade and industry. It was here Buddha preached his final sermon and announced his nirvana. To commemorate this event, Emperor Ashoka, in the third century B.C. erected the famous lion pillars here. 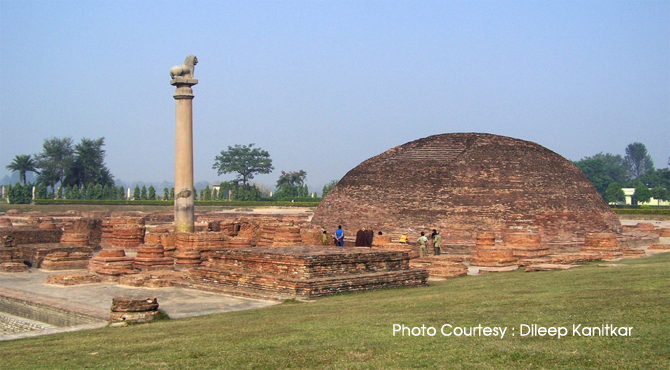 A century later, years after the Mahaparinirvana of the Buddha in 383 BC Vaishali was the venue of the second great Buddhist council. Two stupas were erected to commemorate this event. Jainism, too, has its origins in Vaishali. Swethambara sect believe that Mahavir, the last Tirthankar of Jainism was born in Vaishali in 599 BC and lived here till he was 22. The relics of one of Buddha's main disciples Ananda were enshrined at Vaishali. Vaishali is also the place where the famous royal courtesan Amrapali used to live. Known as Vaishali ki Nagarvadhu, she was a great devotee of Lord Buddha. The places also hosts Vaishali Mahotsava, an important festival which is held to celebrate the birth anniversary of Lord Mahavir. It is celebrated on the full moon day of Hindu month 'Vaisakh' (Mid- April). The Ashoka Pillar at Kolhua was built by the great Emperor Ashoka. Regarded among eight most important events of Buddha's s life, according to Buddhist literature, Kolhua is where Lord Buddha spent many years and offering honey to Buddha by the monkey chief. The Pillar is probably one of the earliest pillars built by Emperor Ashoka. Also known as Bhimsen ki Lathi, it is a single piece of very highly polished red sandstone, surmounted by a bell shaped inverted lotus capital, 18.3 m high. A life-size lion carved on top of the pillar. There is a small tank here known as Ramkund. This pillar beside a brick stupa at Kolhua commemorates Buddha's last sermon. Built during the Pala period, it is an ancient tank. It stands as a historic monument and attracts many tourists. On the northern bank of the tank lies an old temple Bawan Pokhar. Built during Pala period, it enshrines beautiful images of Hindu dieties dating back to the Gupta and Pala period. It is here one eighth of the sacred ashes of the lord Buddha had been enshrined in a stone casket. The exterior of this stupa which is now in a dilapidated condition has a plain surface. Excavated in 1958 led to the discovery of another casket containing the ashes of the Lord Buddha. It contains holy water which was used Lichchavi clan. All of Vaishali's elected representative were anointed here at his coronation. The Lichchavi stupa was located near here. Nearby a 500 m long Lotus Tank. 4km from Vaishali, Kundalpur is the birthplace of the 24th and last Tirthankar, Lord Mahavira. He was born here over 2550 years ago. Mahavir is said to have spent the first 22 years of his life here. The ruin occupies an area enclosed by a wall about 1 km long and 2 m high. It is said to be the ancient parliament house. Over 7,707 representatives of the federal assembly gathered here to legislate and discuss the problems of the day. On the south bank of the coronation tank, built by Buddha Vihar Society. Built over a ruined brick stupa, it contains relies of Hazrat sheikh Mohammed Qazin, a celebrated local saint of the 15th century. On Id-Ul-Fitr, thousands of Muslims gathered here to pay their respects to the saint. Set up in 1971, the museum has four galleries. The first gallery displays the terracotta objects like human figurines, mother and child, Durga, plaque of Buddha etc. The second gallery displays terracotta figurines of ram, elephant, horse, dog, monkey, birds, snake hood, seals and sealings, wheel, beads etc. Potsherds of NBP and PGW which include bangles, arrowheads, bones etc are displayed in third gallery. Earthen wares displayed in fourth gallery. The museum, closed on Friday. Entry time : 10 am to 7 pm.